I'm thrilled to share with you about American Greetings re-launch of PhotoWorks. I love personalized photo products of my kids. 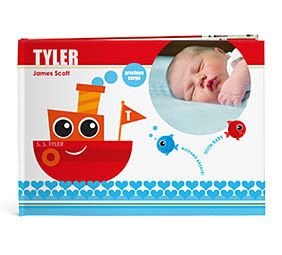 They make great keepsakes for Mom and wonderful gifts for grandparents. Some of the newest updates to the site include improved navigation, a new search function to make finding products a snap, easier access to help, more robust merchandising to gu ide product selection, faster uploads, simplified photo sharing, streamlined ordering and so much more to make your photo experience more enjoyable. Recently I created a baby photo book with photos of my son from birth through his first year. PhotoWorks was very simple to use. Uploading the photos could not be any easier, I really like the drag feaure....... just drag and drop on the page! Besides photo books their is tons of items that you can add your photo to, they have something for everyone from books, cards, mugs and even cutting boards. Visit PhotoWorks then come back here and tell us what photo product you would purchase if you win! One winner will be chosen ! I will be using a random number generator to select the winner. Contest ends at 11:59pm CST on 3/21/10. If the prize is not claimed in 48 hours a new winner will be chosen.Contest open to U.S. residents only. Disclosure: I did not receive any compensation for this post. M80 contacted us on behalf of Photoworks . I would love to get a few of the photo tiles. They are great. I would get an 8.5x11 photo book for my Mom. I would either choose the Scrapbook design with the Mom and heart on the front or the Traditional Mom design. They have a lot of nice designs to pick from. I would like to get some of the photo tiles. I would get the photobooks. I would get the 8x8 book to showcase my twins first birthday. I would order some photo tiles. I would love to have a photo tile made! Cool - I love Photo Works! I'd get a 12x12 Oversize Personalized Cover or a similar photo book with the photos of our house building process. Thanks! I would get the Love Ornament and the Photo Coasters. I love the woven photo throw. Thanks for the chance. I'd buy the Midtown 12x12 photo book. Thanks! I would get a black and white canvas photo of my girls for my newly remodeled bathroom! I would buy the Personalized Cover photo book! I would love the mouse pad! I would love to do one of the NASCAR Photobooks. We are huge Dale Jr. fans. I like the Patchwork Girl book. I'd make a photo book for the parents! I would puchase two Porcelain Ball Ornaments one for each set of grandparents! I am now subscribing via email! I am a facebook fan of Life In A House of Blue! I would make photo books. I would get the personalized photo calendar. I would like the photobooks! Would love to get my daughter posters of her and her friends for her room! I would get a photo album, I have tons of pictures I need to print off. I would make a pillow case. How fun!